Can you confirm these amateur observations of Oligosoma waimatense? Type locality: Waimate, South Island, 171° 03’ E, 44° 44; S.
Diagnosis Diagnosis. 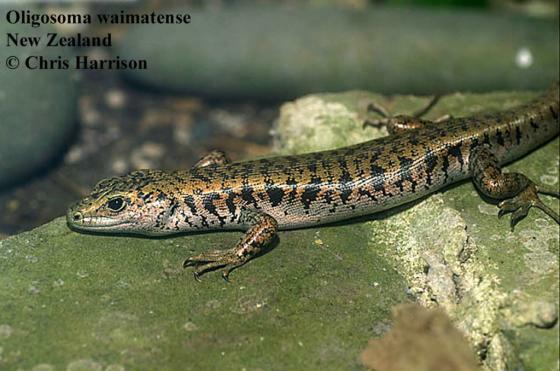 O. waimatense can be distinguished from all other New Zealand skinks chiefly by colour pattern and scale counts. The very high midbody scale count (50-68 rows) alone overlaps with only two other species, O. grande and O. otagense. Another distinctive feature of both Otago skinks and scree skinks is an enlargement of several upper ciliary scales to form a flap overhanging the eye. This is more pronounced in O. waimatense than O. otagense. Unlike members of the O. nigriplantare species complex, O. waimatense has not been found to occur sympatrically with O. grande or O. otagense, the congeners it most closely resembles, and this removes some of the difficulty in differentiating these species. The ground colour in O. waimatense is different from the yellow seen in most O. grande, and forms more regular patches on the dorsum. Also, the orange-pink ventral coloration seen in some specimens has not been observed in O. grande. O. waimatense is a larger, bulkier animal than O. grande, which has a much more triangular head. In O. waimatense and O. otagense the head is quite elongate relative to most other New Zealand Oligosoma. O. waimatense is rather less heavily built than O. otagense, particularly where the tail joins the body. Thomas (1982) noted that O. waimatense has a more erect posture than O. otagense. Unlike O. otagense the paler colour patches on the dorsal and lateral surfaces are broken into smaller clusters. The orange-pink ventral coloration seen in some O. waimatense specimens has not been observed in O. otagense. The ventral surface of O. otagense is mottled, unlike that of O. waimatense. McCann, C. 1955. The lizards of New Zealand. Gekkonidae and Scincidae. Dominion Museum Bulletin (17): 1—127. Patterson, G.B. 1997. South Island skinks of the genus Oligosoma: description of O. longipes n. sp. with redescription of O. otagense (McCann) and O. waimatense (McCann). Journal of the Royal Society of New Zealand 27(4): 439-450. Wells, R. W. and Wellington, C. R. 1985. A synopsis of the Amphibia and Reptilia of Australia. Australian Journal of Herpetology, Supplementary Series, (1):62-64.